Have you ever been stuck in a long line of planes waiting to take off at Logan International Airport and wondered what the problem was? So have researchers at MIT. And a test they conducted to make the traffic flow more efficient has the potential to solve a big problem at airports across the country. Working with air traffic controllers in Boston, a team of researchers from the Massachusetts Institute of Technology found that holding planes for an average of four minutes longer at the gate — instead of having them line up like dominoes on the runway — reduced taxi times by 20 percent and cut fuel consumption by up to 20 gallons per plane without increasing flight delays. The study, funded by the Federal Aviation Administration, could eventually be used to create a tool that tells air traffic controllers across the nation when planes should leave the gate. “This has a potential to be a game changer for how air traffic control operates in the United States,’’ said Flavio Leo, deputy director of aviation planning for the Massachusetts Port Authority, which runs Logan and partnered with MIT on the study. The study, which is part of the Partnership for Air Transportation Noise and Emissions Reduction — a research organization based at MIT and sponsored by the FAA, the Environmental Protection Agency, and others — could have big implications for the environment, for travelers, and for airlines, which are grappling with skyrocketing fuel costs. Tarmac delays have been the subject of great scrutiny lately, following incidents such as the Cancun-bound JetBlue flight that spent eight hours sitting on the tarmac at John F. Kennedy International Airport during a storm in 2007. Now, a Department of Transportation rule slaps airlines with a $27,500 per passenger fine if they sit on the tarmac for more than three hours. 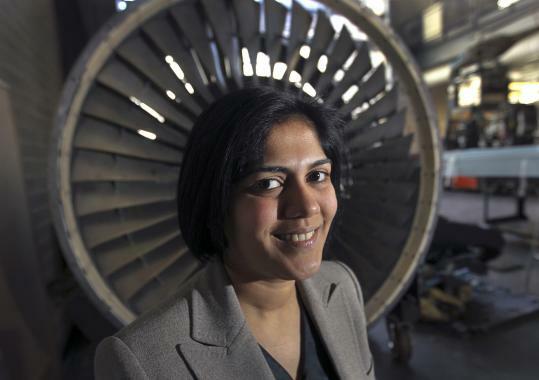 The MIT study wouldn’t necessarily help with these kinds of lengthy delays, but could help reduce the amount of time people spend sitting on planes, said Hamsa Balakrishnan, assistant professor in MIT’s Department of Aeronautics and Astronautics, who oversaw the project. That would be welcome news for Mark Latina. Latina, an ophthalmologist from North Andover, has been stuck on the tarmac at Logan multiple times — seat belt securely fastened, jet engines roaring — while the pilot waited to take off. Controlling when planes head out to the runway also cuts back on fuel consumption. At the gate, planes are powered by auxiliary engines and plug-in units, so it’s more efficient to wait there instead of idling on the tarmac with their main engines running. Over 32 hours of testing, 247 planes spent 18 fewer hours with their engines on than they normally would have, conserving 16 tons of fuel. Before going out to the Logan control tower, the MIT team — made up of two professors, a research engineer, and two graduate students — analyzed traffic flow data at the airport and calculated the most efficient “pushback’’ rates for planes leaving the gate, depending on runway configurations, weather, and the rate that planes are arriving. Then, two at a time, they conducted eight four-hour tests on commercial flights in August and September. They weren’t allowed to talk to the air traffic controllers guiding planes in and out of Logan, so they stood at the back of the tower — “pretending to be invisible,’’ Balakrishnan said — and placed laminated cards with “suggested push rates’’ in front of the controllers: four per five minutes, two per three minutes, one per minute, and so on. During a time when 15 to 20 planes would typically be released from the gates every 15 minutes, the MIT researchers found that scaling back that number to 12 led to a more efficient departure process. While the researchers were controlling the pushback rate, the average trip from the gate to the sky, known as taxiing, was reduced from 20 minutes to 16. Taxi times have been on the rise over the past 15 years. At Logan, the average taxi time last year was 19.6 minutes, the eighth longest in the country and a more than four-minute increase from 1995, according to the Bureau of Transportation Statistics. Nationwide, the average taxi time was 15.6 minutes, up nearly two minutes from 1995. In some ways, the study’s findings are counterintuitive. Usually the sooner you leave, the faster you get somewhere. But the MIT researchers found that when the runway was being used efficiently, staying at the gate longer meant a shorter taxi time. “When you’re decreasing congestion, the predictability improves,’’ Balakrishnan said. The FAA called the MIT study results “promising,’’ but said that more testing needs to be done in different conditions and at additional airports. “The amounts of fuel saved are significant enough and attractive enough that we’re going to continue working it,’’ said Lourdes Maurice, acting director of the FAA’s office of Environment and Energy. K atie Johnston Chase can be reached at johnstonchase@globe.com.